12 Box Factory Sealed Hobby Case. Configuration: 12 Boxes Per Case. Look for Yu Darvish Autographed Bowman Chrome Rookie Cards! Look for Bryce Harper Bowman Black Autograph Cards!! Harper will be Lucky Redemption # 2! The card, which will be limited to 100, will feature Harper in the RC design and will include his Autograph. Look for (1) Autograph Card per box! Find On-Card Autographs featuring Gerrit Cole (1st Pick), Danny Hultzen (2nd Pick), Anthony Rendon (6th Pick), and more! THE BOWMAN BLACK COLLECTION - AUTOGRAPHED ROOKIE ORIGINALS - AFLAC HIGH SCHOOL ALL-AMERICAN AUTOGRAPHS - WRAPPER REDEMPTION PROGRAM. Key Rookies: Yu Darvish, Yoenis Cespedes, Brett Lawrie, Jesus Montero, Alex Liddi, Tom Milone, Leonys Martin, Michael Taylor, Matt Moore, Drew Pomeranz, Jarrod Parker, Devin Mesoraco, Joe Benson, Brad Peacock, Addison Reed. Topps has announced the final checklist of 2012 Bowman Chrome Prospects autographs that will appear in 2012 Bowman Baseball. Andrelton Simmons, Atlanta Braves Andrew Susac, San Francisco Giants Anthony Rendon, Washington Nationals Austin Hedges, San Diego Padres Brandon Drury, Atlanta Braves Brandon Jacobs, Boston Red Sox Bryan Brickhouse, Kansas City Royals Carlos Martinez, St. Louis Cardinals Charlie Tilson, St. Louis Cardinals Cheslor Cuthbert, Kansas City Royals Clay Holmes, Pittsburgh Pirates Daniel Norris, Toronto Blue Jays Danny Hultzen, Seattle Mariners Dante Bichette Jr.
New York Yankees Dean Green, Detroit Tigers Dillon Howard, Cleveland Indians Dillon Maples, Chicago Cubs Drew Hutchison, Toronto Blue Jays Eddie Rosario, Minnesota Twins Eric Arce, Toronto Blue Jays Gerrit Cole, Pittsburgh Pirates Greg Bird, New York Yankees Jackie Bradley Jr. Boston Red Sox Jacob Anderson, Toronto Blue Jays Jeimer Candelario, Chicago Cubs Joc Pederson, Los Angeles Dodgers Joe Ross, San Diego Padres Josh Bell, Pittsburgh Pirates Julio Rodriguez, Philadelphia Phillies Kes Carter, Tampa Bay Rays Matt Purke, Washington Nationals Nick Delmonico, Baltimore Orioles Nick Maronde, Los Angeles Angels Oscar Taveras, St.
Louis Cardinals Rookie Davis, New York Yankees Tommy Joseph, San Francisco Giants Tyler Collins, Detroit Tigers Xander Bogaerts, Boston Red Sox. Autographed Bowman Chrome Prospects (30 Sub jects): Hobby Only! Refractors #'d to 500 Blue Refractors #'d to 150 Gold Refractors #'d to 50 Orange Refractors #'d to 25 Red Refractors #'d to 5 Super-Fractor #'d 1 of 1. Bowman Chrome Autographed Rookie Cards: Hobby Only! Refractor #'d to 500 Blue Refractor #'d to 250 Gold Refractor #'d to 50 Orange Refractor #'d to 25 Red Refractor #'d to 5 Super-Fractor #'d 1 of 1. The Bowman Black Collection NEW! Featuring autographed buybacks of players that never had a Bowman autographed prospect card. Aflac High School All-Amer ican Autographs NEW! Sequentially #'d - Additional hit! Bowman's Best (50 Sub ject s): 1:6 Packs! Die-Cut Refractor #'d to 99. Die-Cut X-Fractor #'d to 25. Die-Cut Atomic Refractor #'d 1/1. Bowman SILVER ICE (330 Sub ject s): 1:24 Packs! Red Ice #'d to 25 HOBBY ONLY! Printing Plates (490 Subjects): Hobby Only! Bowman Chrome Prospects (110 Subjects): BCP1 - BCP110: 2 per pack! Refractor Parallel #'d to 500 Blue Refractor Parallel #'d to 250 Gold Refractor Parallel #'d to 50 Orange Refractor Parallel #'d to 25 Red Refractor Parallel #'d to 5. Super-Fractor Parallel #'d 1/1. Prospects (110 Subjects): 2 per pack! The flag of where the subject was born. Blue-Bordered Parallel #'d to 500 Orange-Bordered Parallel #'d to 250 Red 1-of-1 Parallel #'d 1/1. 190 veterans and 30 Top Rookies. International Parallel Featuring the flag of the player's home country. Gold-Bordered 1 per pack Blue-Bordered #'d to 500 Orange-Bordered #'d to 250 Red-Bordered #'d 1/1. Wrapper Redemption Program (110 prospects). Redeem 24 HOBBY wrappers for an exclusive 5-car d pack of the all-new Blue Wave REFRACTORS. 24 packs per box, Each pack contains five (5) 2012 Bowman Baseball Cards; two (2) Prospects; two (2) Bowman Chrome Prospects; and one (1) Base Gold Parallel Card. 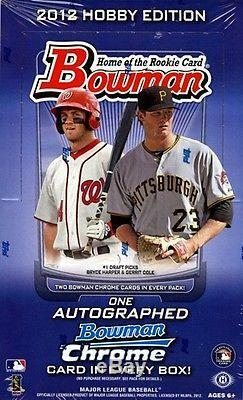 The item "2012 Bowman Baseball Hobby Case 12 Box Factory Sealed Hobby Case 12 Autos" is in sale since Wednesday, October 17, 2012. This item is in the category "Sports Mem, Cards & Fan Shop\Sports Trading Cards\Baseball Cards". The seller is "sportscardsetcpgh" and is located in McKees Rocks, Pennsylvania. This item can be shipped worldwide.